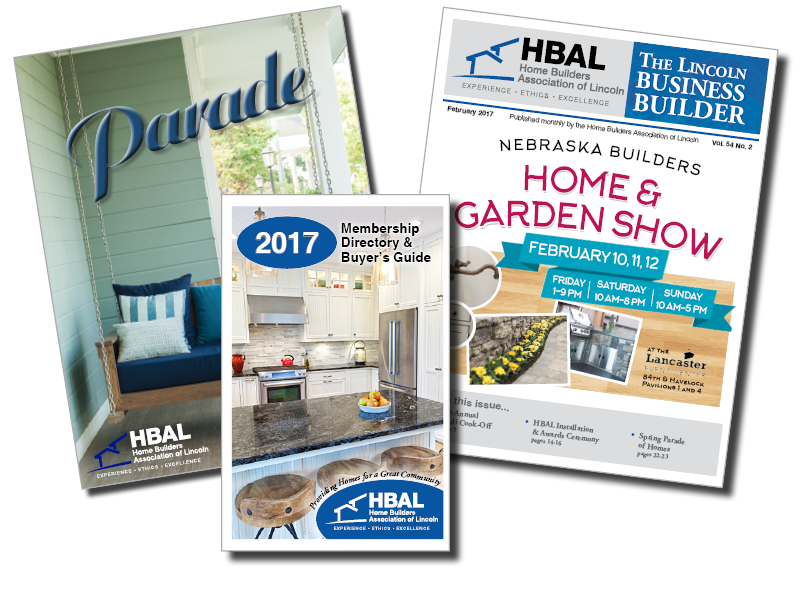 The Home Builders Association of Lincoln offers a variety of advertising options for Lincoln businesses. You don’t have to be an HBAL member to participate, however members receive a discounted rate. Lincoln Business Builder – This monthly publication is mailed to over 750 HBAL members. Ad rates start at $37 per month. Parade Guidebook – Published twice a year, this publication is distributed to thousands of visitors during the Parade of Homes event in the spring and fall. Membership Directory – The HBAL Directory is published once a year and mailed to all HBAL members. Mailing Labels – HBAL members can purchase mailing labels for Builder Members, Associate Members or the entire membership. www.HBAL.org – The HBAL website was created as a resource for both the public and HBAL members. Click here for details on advertising on www.HBAL.org. Click here for a complete list of rates. Contact Jennie Korth for more information. Corporate Sponsorship encompasses many of the above items as well as sponsorship opportunities at the Home Show, Chili Cook-off, Golf Tournaments, Hog Roast and Sporting Clay Shoot. Contact Michaela Harrison for more information.